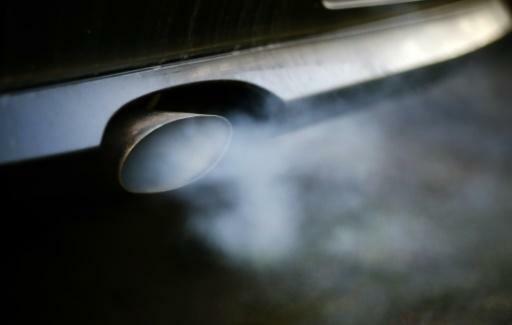 The German government will Tuesday present its compromise on the way forward for millions of people with older, more polluting diesel cars, with manufacturers potentially facing a steep bill for the crisis precipitated by an emissions cheating scandal. After Chancellor Angela Merkel and key ministers deliberated late into Monday night, her conservative CDU/CSU alliance and coalition partners the Social Democrats (SPD) announced "a concept for clean air and to secure mobility in our cities". Details are to be presented Tuesday. The diesel summit aimed to purge city air of pollutants while sparing car owners additional costs. At stake are potentially billions of euros in trade-in bonuses for buyers of new cars and costs to refit older vehicles, as well as the future of the auto sector and its 800,000 jobs. Major cities Hamburg and Stuttgart have closed parts of their territory to older diesels and court-ordered bans are looming elsewhere. Above all, "we want to avoid further driving bans," Transport Minister Andreas Scheuer told news agency DPA ahead of the start of the meeting on Monday evening. Manufacturers could however face a steep bill, with SPD Environment Minister Svenja Schulze stressing that it was "the car industry that got us into trouble, and it should pay for it". Three years have passed since Volkswagen's 2015 admission to installing cheating devices in 11 million vehicles worldwide, allowing them to secretly spew far more harmful nitrogen oxide (NOx) than legally permitted. Since then, other carmakers like BMW and Daimler have been targeted in official probes and forced to recall thousands of vehicles. Some 70 German cities recorded levels of nitrogen oxide (NOx) -- which can cause respiratory illnesses and heart problems -- above EU thresholds in 2017, according to the Federal Environment Agency. Politicians face pressure from activists to use bans and other harsh measures to prevent thousands of premature deaths the fumes are estimated to cause each year. On the other hand, diesel drivers are anxious not to see their vehicles' value tumble. And car industry chiefs say they need to hold onto their cash as they look to invest in staying competitive with challengers from the US and China. Many in Merkel's conservative CDU/CSU alliance and car executives would prefer to sell millions of new cars to replace more polluting older models. "The fastest and best way for the environment is to replace the old fleet with a new one," the chancellor said Thursday. With tighter limits on emissions of carbon dioxide (CO2) biting in the EU from 2021, manufacturers are eager to get as many of their newest, cleanest cars on the road as possible. Merkel promised "possibilities for some to obtain a refit" in the final deal, adding that "in this case, we believe that the customer should not have to pay anything". Manufacturers showed some signs of movement Monday, Scheuer said, offering between 4,000 and 8,000 euros ($4,630 to $9,260) to owners looking to trade in their vehicles for the latest models. It was not clear whether trade-in incentives would be targeted at owners in only the most polluted cities or nationwide. And manufacturers were less open to footing the full bill to refit older cars with more effective exhaust treatment systems. In a further sore point, foreign carmakers have so far ruled out funding refits. The contrast between carmakers' ability to dig in their heels in Europe, compared with Volkswagen's mammoth bill for fixes and buybacks in the United States, has riled consumer advocates. Dieselgate has so far cost VW 27 billion euros in compensation, buybacks, fines and legal costs -- much of it in the US -- and the group remains entangled in legal woes at home and abroad. Nevertheless, it booked 11.4 billion euros in profit for 2017. Will Germans, or German carmakers breathe easier after the government makes a decision on how to deal with dirty diesels? 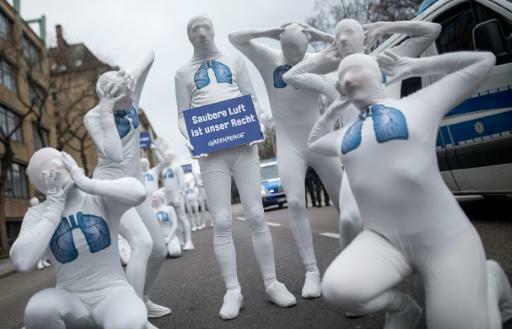 Greenpeace activists wearing white morphsuits with lungs painted on them demonstrated for clean air in Stuttgart in February. The sign read: "We have the right to clean air"